The buzz about EVO ~ the Living Earth’s latest dining venue ~ has risen to such a pitch that I realized I had to investigate. But first, recalling that many years ago I reviewed their Garden Café, I searched my hard-drive to find those notes. What immediately struck me was the level of sarcasm I’d heaped upon the altar of vegetarianism. How unfair and unnecessary! It’s not as if Buddhist monks had force-fed me fungus burgers…In fact, I still remember the delightful salmon meal I enjoyed that evening. So in this bicentennial year of Darwin’s birth, I’ve resolved to evolve ~ no more cheap cracks regarding the various real and imagined food neuroses cluttering America. 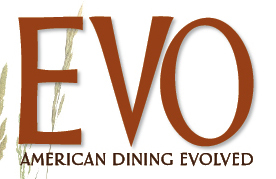 EVO bills itself as “American Dining Evolved.” Oh, the loftiness of this declaration tempts my baser instincts. But, having recently evolved, I’ll try to explain. At EVO one may order classic American Cuisine ~ from Panini melts and Kobe burgers to steak-and-potatoes. But vegans sitting at the next table might be allergic to wheat gluten. EVO will seamlessly satisfy everyone’s special needs. Plus the dining room is totally new, decorated with plenty of earth-tones, sophisticated details and a full-service bar. What a concept… non-judgmental vegetarianism! To see it all in action a friend and I stopped in on a beautiful summer evening. We were led around wooden beams and past strung bead dividers to a booth. Laura, our server, soon appeared and was ready to take our drink order ~ but I needed some time to plan my meal. She urged me to take all the time I needed and left us with a basket of sliced fresh bread and mild garlic herb-infused dipping oil. Having heard raves about EVO’s Caesar salad, we decided to share one for our appetizer. Perhaps the salad chef was away that evening. This salad was certainly passable; the dressing started out satisfying but failed to reach true greatness. Another squeeze of lemon, crush of garlic or dash of mustard ~ any of its basic ingredients ~ would have been all it needed. Its most significant source of flavor came from the tasty fresh white anchovies ~ one for each of us. Fortunately, our entrees proved exponentially better. My friend’s New York Strip Steak was perfectly seasoned and juicy. Scored with classic char-lines, it was grilled medium-rare, exactly as ordered. The plate came with glistening sugar snap peas that provided a contrasting crunch and a heap of smashed potatoes all sitting in a pool of demi-glace that added rich flavor to every forkful. My Seafood-Stuffed Statler Chicken Breast was another success. In true Statler form, the breast came with drumstick attached and had been stuffed with a soft mixture of scallops, shrimp and crabmeat. Then it was breaded with what appeared to be soft panko crumbs and baked golden-brown in a hot oven. Most often I avoid any stuffed chicken dish; they’re usually built in factories and lacking any flavor. But this was exquisitely flavorful chicken with delicately flavored seafood. It came with emerald-green sautéed spinach. Another potential risk to my entrée was its sherry cream sauce. Anything sherry in the hands of too many chefs proves disastrous and I try to steer clear. But this sauce made me sit back and take notice. Easily missed if one were in a rush, its flavor was so subtle it encouraged me to slow down and enjoy my entrée in a more civilized manner. I matched it with a glass of Leyda Sauvignon Blanc which provided contrasting pineapple and citrus-crunch flavors. On Laura’s recommendation, we shared a bowl of EVO’s Crème Brûlée for dessert. Its surface had some of the crunchy burnt sugar one expects but much less than the classic preparation. This one came infused with Baileys Irish Cream, a flavor touch I can’t say would have been my first choice, but that didn’t stop us from cleaning the dish. We keep hearing that much of the American heartland resists belief in evolution. They also seem to prefer fast-food and restaurant chains. I’ll stick with EVO’s American Dining Evolved for service and cuisine that encourages one to relax, enjoy life, and savor tastes and textures.